How to know when your water heater needs replacing or requires a service? Water is leaking out of the hot water system. The pilot light is not working or goes out often. You are running out of hot water often. The water pressure is low or changes continuously. The system is making rumbling or banging sounds. The water temperature keeps changing. The water is rusty or has sediment in it. No hot water is coming out of taps or water is cold. How do I select a hot water system? First you need to establish what kind of energy source is available to your property – Gas, Electricity or Solar. What are the different types of heating methods for hot water? What kind of hot water systems are there? Storage systems or continuous flow (known as instantaneous). Storage Systems – Water is heated and stored in an insulated tank ready for use. Most gas, electric, solar and heat pump hot water systems use a tank. Continuous – Instant hot water heaters heat only the water required and because there is no storage tank (they are also known as tankless water heaters) so they do not experience heat/energy losses of storage systems. They operate on natural gas, LPG or electricity. Most models use gas, but electric models are available. How much should I pay for a hot water system? Listed below are water heater prices based on the different systems and ranging from minimum and maximum average prices. How do I determine what size water heater to buy? This depends on how many people live in your home, how much hot water you use, and when you use it. A storage heater that is too small will continually run out of hot water, while one that is too large will be more expensive to run because it will maintain the water temperature even when it is not being used. It is important to select the right hot water system for your needs. 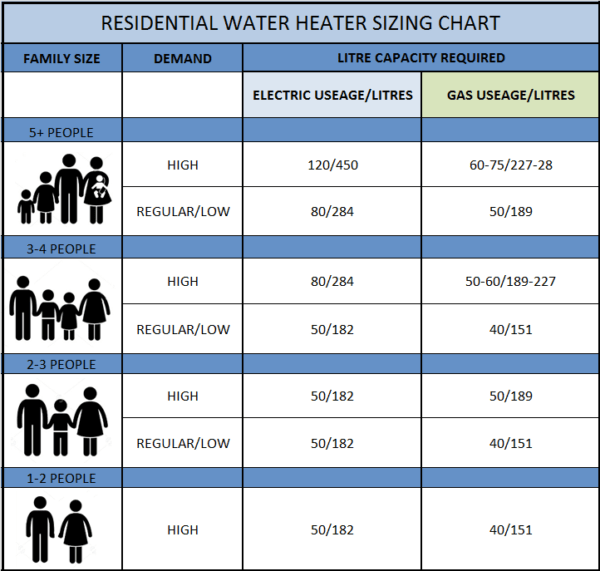 Australian Hot Water will help you choose the right-sized system for your household. This will depend on your energy source, household size, budget, and preference for instantaneous or storage systems. If you’re connected to mains gas and your house gets a fair amount of sunlight, the most ideal system could be a solar storage hot water system with gas boosters. If your property doesn’t get much sunlight, the next best thing is an instantaneous gas system. There is never one model that suits all households when it comes to cutting your energy bill, but electric hot water systems have high emissions and are often considered to be the most expensive option. How do the different systems work and what are the pros and cons? Electric storage hot water systems heat water with an element in the bottom of the unit and store it in an insulated tank ready for use. Continuous systems are similar, but instead the element is coiled around the pipes to quickly heat the water inside. Electric hot water systems have quite low up-front costs and are a reliable way to keep your water warm. Some electric hot water systems can also be pre-set to do the majority of its heating during off-peak periods to help minimise your energy bill. Electrical hot water systems are almost always the most expensive long-term solution. They also have high greenhouse gas emissions and are generally advised against. Storage systems use a gas burner to continuously heat and maintain water in a tank. Continuous flow systems or tankless gas water heaters use a burner which ignites only when the water is needed. Gas hot water systems are only really viable if you’re connected to mains gas, as using gas bottles is more expensive and you could end up running out of hot water. Gas hot water systems must also be located outside, or have an exhaust vent if they are located inside. Solar hot water systems are storage units which generate heat from the sun using panels mounted on the roof of the property. This heat is used to warm and maintain the water in your tank. Solar hot water systems are able to reduce your hot water systems energy consumption by up to 90%, significantly saving on your power bill. Solar hot water systems are also the most environmentally friendly option and energy efficient. Solar hot water systems have the highest up-front costs – anywhere from $2,000 to $7,000 after rebates depending on the system size, and excluding installation costs. Some solar hot water systems can be unreliable on overcast days, though most models will kick-over to gas or electric back-up heating if the water isn’t hot enough. Heat pumps have a fan that draws warm air into the system, which is transferred to the water storage tank. Like a reverse fridge. Rather than pumping out hot air to keep your fridge cool, it pumps hot air in to heat the system up. If you’re replacing an existing hot water system with the same type in the same position, installation costs are relatively low, in the range of $220 to $660. If additional valves are required, or if plumbing or electrical systems require upgrades, costs will be higher.